Uesco Cranes manufactures standard and custom engineered double girder cranes for robust overhead material handling tasks. 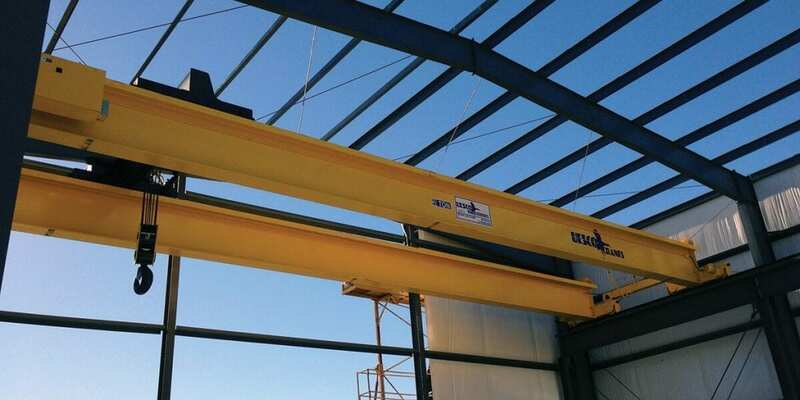 Our double girder dual motor overhead cranes are built to a minimum CMAA Class C service, and those with the Type RA configuration may be rated for Class D service. Depending on the application, we offer a wide variety of hoists and under-the-hook equipment from the top manufacturers in the world. Our crane controls, end trucks, drive machinery, and bridge girders meet or exceed the requirements and expectations of our end users. Stationary Axle (Type SA) – These cranes are available in 3 ton through 15 ton capacity with spans to 60 ft. Standard speeds are 50, 80, or 120 FPM. End truck wheels are stationary axle. Rotating Axle (Type RA) – These cranes are available in 5 ton through 30 ton capacity with spans to 70 ft. Standard speeds are 80, 120, or 150 FPM available in all capacities. End truck wheels are rotating axle. These cranes may be rated for Class D service. Click on the links below to view specifications, diagrams, and information about our double girder cranes.